Promastigotes and amastigotes of Leishmania parasites inside macrophages, illustration. 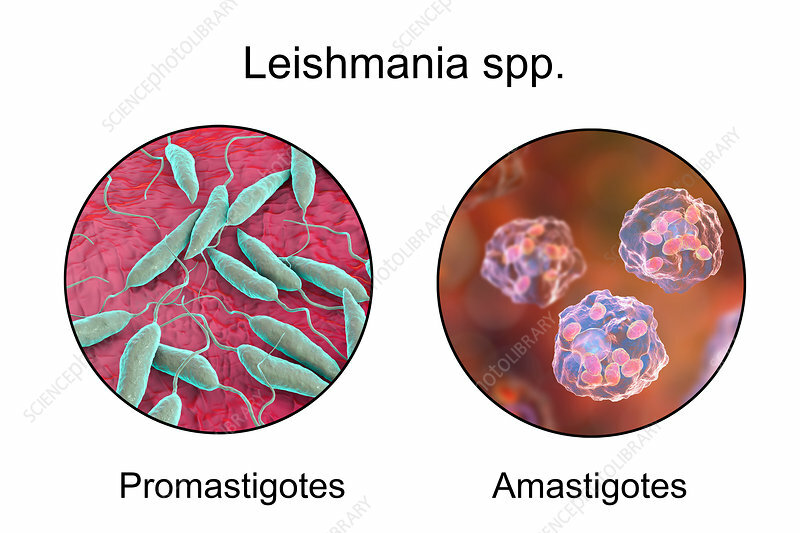 Leishmania sp. cause leishmaniosis, a tropical disease transmitted by bites from infected sand-flies. These are the flagellated promastigote form of the parasite. In humans the flagellated promastigotes stage infects macrophages and are transformed into the amastigote non-flagellated stage. There are two forms of leishmaniosis. The first, cutaneous leishmaniosis, affects the skin giving rise to an ulcer at the site of the bite. This mainly heals naturally, although scarring may occur. The more serious, visceral leishmaniosis (kala-azar), causes fever and liver damage, and can be fatal.